Channel your inner architecture geek in the city&apos;s timeless mid-century modern neighborhoods. 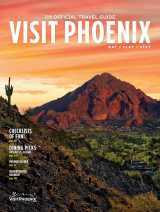 Phoenix is filled with sparkling new housing developments that attract a lot of attention, but not everyone here lives in an amenity-filled subdivision. Some residents happily reside in the minimalist past, living in mid-century modern neighborhoods that have stood the test of time and the shiny lure of master-planned communities. 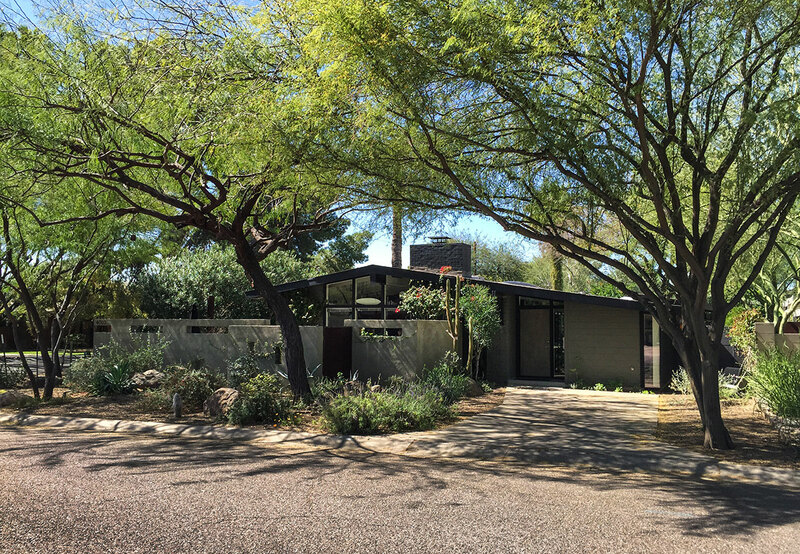 The simplistic features of mid-century design—floor-to-ceiling windows, dramatic roof lines, angular edges, one-level, open floors plans, carports and modularity—are just as appealing today in Phoenix where the distinct architectural elements of the era are visibly intact in many areas. When Marlen Grove was built in 1952, it was advertised as the “Best Value in the West” for families and considered a tract home experiment designed by master architect Ralph Haver. Now, residences in the former citrus grove are widely sought-after by minimalist enthusiasts with an eye for mid-century style and taste for creative lifestyle interpretation. The low-sloped roofs and block construction are still signature forms as are the single carports (with a few exceptions). 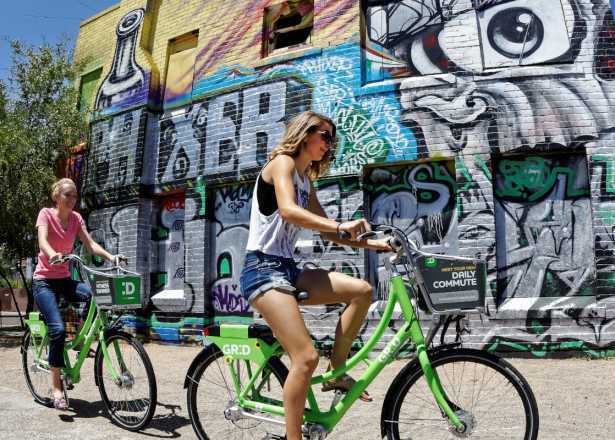 Yet nearly all of the homes in this “Haverhood” have been reimagined with trendy and individualistic curbside statements such as funky geometric yard sculptures, repurposed metal adornments and neon green, orange and turquoise paint touches. Sitting at the busy intersection of 44th Street and Indian School Road that&apos;s saturated with urban conveniences, it’s hard to imagine just seconds away exists a time capsule of residential design. Tucked neatly between 45th Street and 45th Place, from Indian School and Piccadilly Lane is Windemere, a cozy, U-shaped Haverhood built in 1955. Most homeowners have made a range of updates and renovations to their residences—most notably closing carports for additional living space. But Windemere’s low-pitched rooflines and full-glass picture windows are well intact and pay tribute to Ralph Haver’s minimalist vision of keeping things simple, clean and orderly. And despite a lack of sidewalks, the lush, hanging foliage and small front yards give off a refreshing neighborly connectedness not found in most new builds. Though mid-century modern design in Phoenix was intended to be affordable housing for the budget-conscious, the architectural aesthetic found its way into Marion Estates, a pricey development located north of Camelback Road, off 44th Street between Stanford and McDonald drives. The jaw-dropping views of Praying Monk and Camelback Mountain, plus the large lot sizes, created the perfect minimalist backdrop for this hilly subdivision that was outside the city limit when it was developed in 1952. At every winding, elevated turn Marion Estates is an eclectic mix of mid-century influence with both flat and pitched rooflines, carports, detached garages and even a rare split-level—all that take advantage of the stunning vistas with open-concept layouts. The homes, designed by the likes of Ralph’s Haver, Al Beadle and Blane Drake, also run the mid-century gamut from frozen in time to completely remodeled in ultra-modern fashion. As you first enter Paradise Gardens, it looks like a typical stucco and stick neighborhood filled with cul de sac layouts common in Phoenix. After driving a few streets, though, it’s clear the subdivision built in the 1960s is decidedly mid-century with a futuristic spirit. Situated next to the Phoenix Mountain Preserve between 32nd and 36th streets, from Mountain View Road to Gold Dust Avenue, Paradise Gardens started out as an Al Beadle-designed development but the architect abandoned the project at some point. Hence, Paradise Gardens is a hodgepodge of minimalist intent with flat and pitched roof lines, deep overhangs, carports and detached and off-set garages, and the occasional decorative “circle in a block” privacy walls. One mid-century thread is the use of structural plant specimens like saguaros, ocotillos and Joshua trees, which are now mature but still produce an uncluttered but striking landscape effect throughout the quirky neighborhood. Learn more about these neighborhoods and others like them at ModernPhoenix.net, and keep an eye on their site for info on the next Modern Phoenix Week, which features a variety of mid-century tours, workshops and more.